If you read my post yesterday (which I’m sure you all did, riggghhhhht? ), did you guess what I’d be posting about today? Brian and I have talked about getting a food scale on several occasions, so I was pretty excited when the opportunity arose to review the EatSmart scale. Some people like to use a food scale in order to keep track of precise portions for calorie counting, and our scale actually came with a booklet to help you calculate the calories in different amounts of food. For instance – 140 grams of unpeeled potatoes has 107.8 calories. If you’re dieting, this is valuable information for keeping track of how many calories you consume each day. For us, though, we really wanted a food scale for when we bake (not saying I shouldn’t be counting calories… that is an entirely different post!) because we’d heard that gives you a much more accurate amount than measuring by volume. Here’s a great article I found that explains the reasoning behind that. When I received the EatSmart scale, I liked it aesthetically right off the bat. It’s small, sleek, and silver. It won’t take up much counter space, and it blends with the look of everything else we have going on in our kitchen. 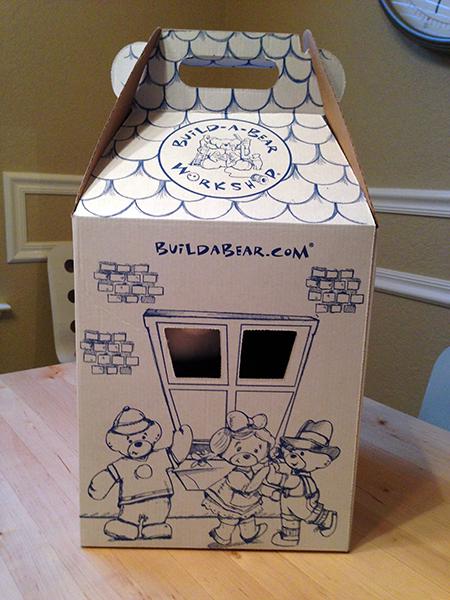 It’s also battery-operated (it came with the batteries), so there’s no clutter from a cord. So, I knew it looked pretty, but that wouldn’t mean a thing if it weren’t easy to use – or accurate. Time for a test. We weren’t going to be baking anytime soon, so I decided to just try it out with some chopped pecans I had on hand. 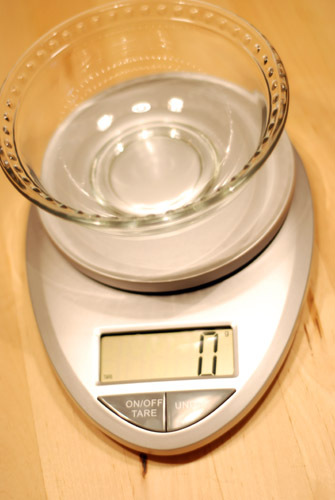 First, I placed the bowl on the scale, and discovered a nice feature of this scale – Tare. 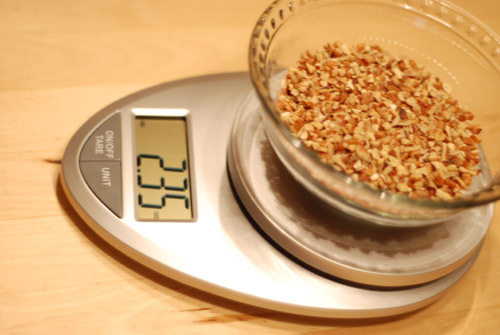 I turned on the scale, placed the bowl on it, and pushed the Tare button – voila! The scale zeroed out so I’d get the weight of the pecans without including the weight of the container. 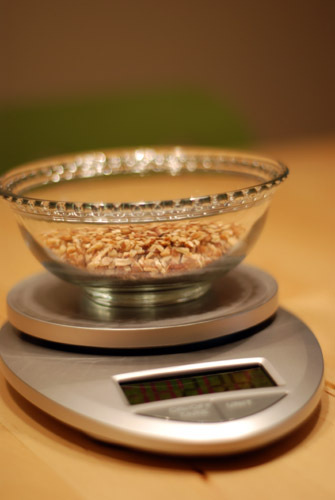 Once I poured pecans in, I tested the “Unit” button on the right – it displays weight in grams, ounces, pounds, or kilograms. Brian, being the smart (and technologically-minded) guy that he is, figured out an easy way to check the accuracy of the scale. He set his iPhone down and then compared it to the specs online, and it was spot-on. I’d give this scale five stars. I haven’t had it enough to know how long the battery life lasts, but I’m completely impressed with every other feature, and I know it’ll be a valuable tool for us to have in our kitchen. You want one too, don’t you? Well, I can help with that! 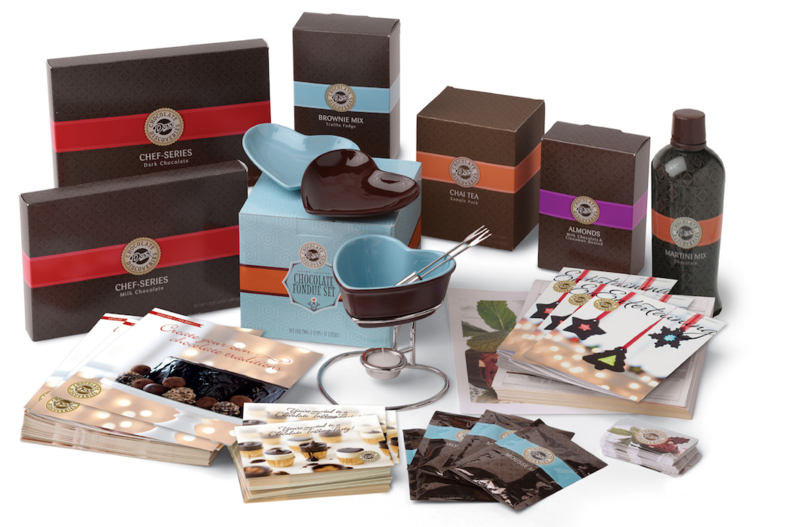 You can, of course, buy one from Amazon, but EatSmart has also provided a scale for a giveaway – so you could win one for your own kitchen. You could win the EatSmart Precision Pro, which sells for $25 on Amazon. This contest is open to U.S. residents only. Entries will be accepted until midnight CST on Wednesday, July 7. I will select a winner with random.org. Note: This was not a paid post, and honest opinions were provided. EatSmart provided me with the scale for review, and is providing the scale for the giveaway. I was not compensated monetarily. I was just looking for this info for some time. After 6 hours of continuous Googleing, finally I got it in your web site. I wonder what is the lack of Google strategy that do not rank this type of informative sites in top of the list. Generally the top websites are full of garbage. Can I simply say what a comfort to find somebody that actually knows what they’re discussing on the internet. and understand this side of your story. I can’t believe you’re not more popular given that you definitely have the gift.